Bev's Country Cottage Blog: International what????? Crocheting, knitting, holidays, religious thoughts, family, holidays, & more! Why not take our yarn stashes and turn them into newborn hats, booties, and blankets wherever we live, to actually help newborns in hospitals near us? 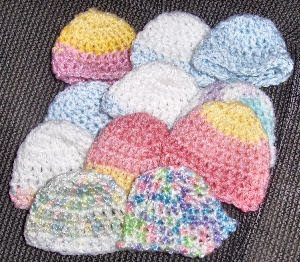 Hat pattern for Bev's plum preemie hats pictured above. I am going pledge to make 5 sets! I might be crazy, since I rarely have time to even grab yarn these days, but I want to make a statement of my own. We knitters and crocheters love to use our yarn to pretty up people, especially babies! 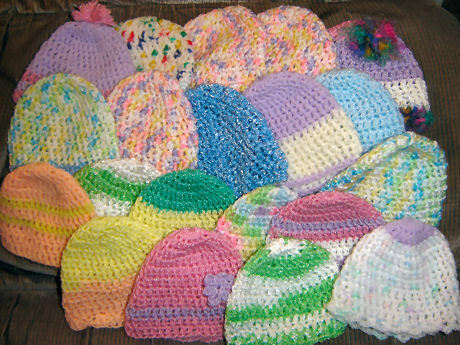 Bev's NEWBORN ROUNDIE HATS, HATS, HATS! For this pattern in SWEDISH, click here! Less than 1 oz baby or sport yarn OR soft worsted weight yarn. Hat is about 5" - 5.5" tall, and measures 5.25" - 5.75" across at the base. * PLEASE make sure newborn hats are at least 5" tall! Join with a slip stitch in top of 1st dc of previous rnd. You can do a final loopy row of ch 4 skip a dc, sc into the next, ch 4, skip a dc, sc into the next etc. You can also do rnd 10 using an alternating front post and back post dc. Or sc around for an 11th row using an alternative color. Little flower: Ch 8, join with a sl st in the first chain, ch 8, join again in that first chain, repeat to make 6 loops/petals. Thread the 2 ends (starting and ending yarn) into the hat, about 1 dc apart. Tie them together 3 times inside the hat. I am with you!!!! What a waste of yarn! Why not have a knit or crochet-along for a charity? Weather is nice enough, do it outside!!! The great satisfaction I get from knitting and crocheting is knowing that someone is benefitting from my skill. Hats and blankets,even facecloths, can make an artistic statement while still being functional!! I'll be making washcloths for tornado victims, while they are "yarn bombing"
Wonder which will be most appreciated? I get the most satisfaction from the knowledge that someone will benefit from my skills. While they are wasting yarn on the yarn bombing, I'll knit wash cloths for tornado victims. Wonder which will be appreciated more? Bev, my daughter is going to have a baby that will need to be born at childrens hospital in omaha ne. I want to make a gift for the hospital by making the small preemie things thanks for the patterns and the information, it takes some of the scary away! Knitted slippers for LDS Humanitarian!! Kids scarf pattern and need TODDLER HATS! Just popping in to say HI! ♥ Bev's Fave Blogs and Crafty Sites! BEV'S COUNTRY COTTAGE my website with free patterns for home and humanitarian, recipes, preparedness, and lots more! Patricia in France! My daughter's BLOG about life as an American in France! My children and I are active members of the Church of Jesus Christ of Latter-day Saints. I am very happily married to my best friend Mike (for the past 38 years (Aug 11, 1979! ), and we have 5 children plus 2 daughters in law, and a son in law - 7 grandsons and 4 granddaughters! I have lots of hobbies and keep really busy all the time! I am currently Wolf Cub scout den leader also serve as a Visiting Teacher. I also work part time as the Support Specialist for the Logandale NV Seminary/Institute. I also work online on my website Bevscountrycottage.com. And now--an ETSY shop too! http://www.etsy.com/shop/bevqual We love living in Logandale-- it's small, and one of the most beautiful places on the planet. The people here are family to us, and there is such a good spirit abiding here. Hubby and I love to watch Star Trek together; and British Comedy on netflix.